We all know that facebook has eliminated the *Become a Fan* button and has replaced it with the more generic *Like* button. Like it or not. But there still are 2 different options to express your appreciation for an (external) page: You can *share* it by clicking the *share* button or you can *like* it. To *Like* an article, a page, or any kind of content on the web, all you have to do is click the *Like* button, and your profile will be updated with this information. 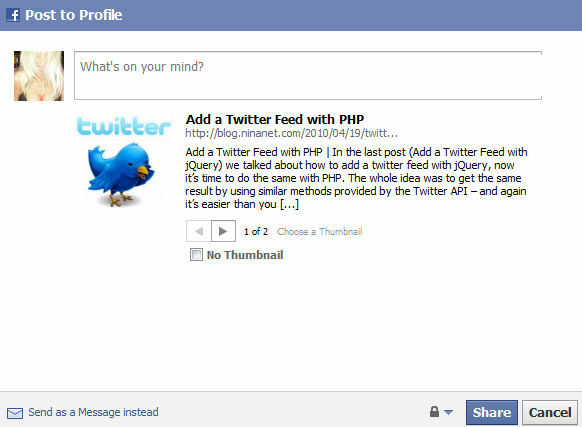 Similar to *liking* your friend’s status, link, video or anything else you can post/put on facebook. If there is a *Like* button, that is. The *Like* button will turn dark blue, your *like* is added to the counter (if displayed), and (most likely) your facebook profile picture will show. Another click on the dark blue *Like* button let’s you "unlike" the item again, your *like* gets subtracted from the counter and your picture gets removed. The *Share* button is a convenient way to take an article, a video, a picture, or anything else that can be accessed via a URL and post a link to that content on your wall. It eliminates the steps of copying the URL, opening your facebook page and pasting the URL into the box labeled "What’s on your mind?". It works in the exact same way as adding a post that contains a link to your wall, you can add a comment to it, select a thumbnail or send it as a message. The *Share* counter needs a minimum of 3 *shares* until the counter is being displayed. *likes* show up immediately, even if only 1 person *likes* it. You can *like* something but don’t necessarily want to *share* it: maybe because *liking* is quick – click, done. You can still *share* the article after *liking* it. And vice versa. Too bad we all cannot *Unlike* the *Like* button. There is already a variety of WordPress plugins available for both buttons, and both facebook’s *like* documentation as well as facebook’s *share* wiki have wizards that let you create the button code. You can see that at the top of the postings we don’t display the *Like* counter or the profile picture; simply because we wanted to keep the button lineup to the right of the article. At the bottom of the posting however we do show the full *Like* button together with the counter and the profile picture.